Create multilingual content for every inch of your website. Translation by Supsystic plugin is easy in use and gives you an opportunity to reach new audience with minimum of efforts. Download Translate by Supsystic plugin. Upload to your WordPress plugins directory. How to use Translate plugin by Supsystic? Install plugin, setup languages and start translate your content. More info you can find in step by step guide "How to use Translate plugin by Supsystic". If you have some problem with our Supsystic plugins – plugin is not working at all or partially – please, take into account the most common causes of plugin-crashing. The problem could be in URLs, codes, updating of the plugins, their compatibility, script, conflicts of the styles, etc. Follow this link to solve the problem you meet. How to switch languages on frontend of the site? 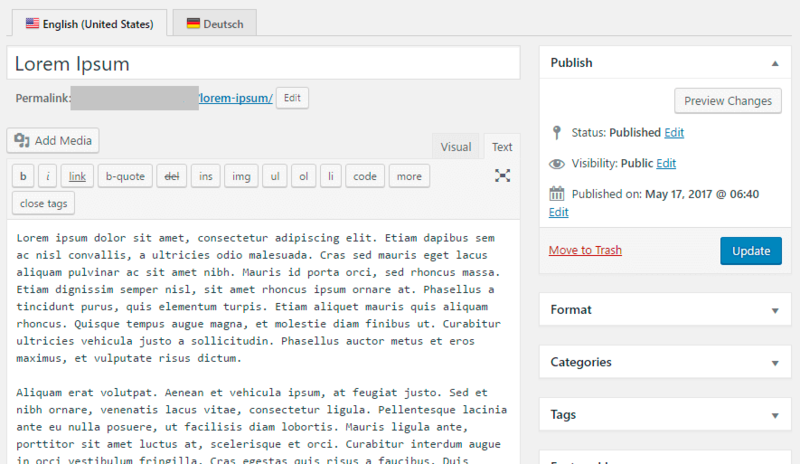 Go to WordPress navigation menu -> Appearance -> Widgets and add Translate by Supsystic widget. Customize widget settings and save the changes. Now your site will contain a Translate widget. Site visitors will be able easily switch the language what they need by clicking on links/buttons in Translate widget.